ANAHEIM, Calif. — The Seattle Mariners remained true to their aggressive offensive style Sunday and put together the breakout game they have been looking for in an 8-5 victory over the Los Angeles Angels. The Mariners pounced on Angels starter Felix Pena for seven first-inning runs that seemed to lift their recent offensive anxieties. Zunino finished with three RBIs, adding a third-inning RBI double, and Mariners starter Marco Gonzales (12-5) went six strong innings to improve to 5-0 with a 1.57 ERA over his last five starts. An inconsistent offence has plagued the Mariners, who have scored three runs or less 12 times since July 6. The entered Sunday's game with 3.25 runs scored per game in July, after scoring 4.74 in March/April, 4.05 in May and 4.50 in June. Gordon opened the game with a bloop single to right-centre field, his major league leading 32nd hit to lead off a game. He also scored for the 20th time when leading off a game, coming home on a Jean Segura single after he stole second base. 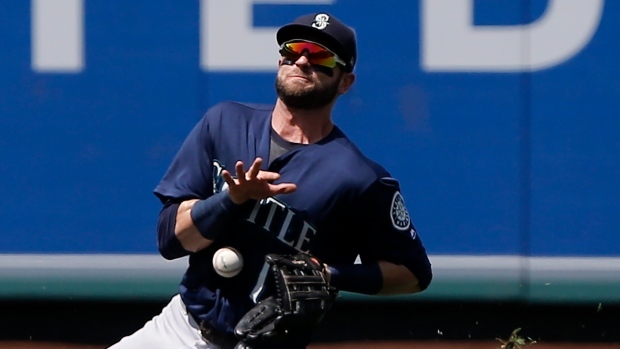 "Our offence is always aggressive and our guys are going to get their hacks in, but you have to get good pitches and we did a good job of keeping the line moving," Mariners manager Scott Servais said. "We sent 11 guys to the plate in the first inning. We have not brought 11 guys to the plate in any inning this year, or at least it's been a while." Home plate umpire Lance Barksdale was hit directly in the face mask by a 92-mph fastball from Angels right-hander Cam Bedrosian in the third inning but remained in the game. Barksdale was knocked to the ground before continuing after a short delay and met with Angels trainer Adam Nevala after the half inning. LHP Tyler Skaggs (8-6, 2.62 ERA) will look to remain hot for the Angels when he pitches Tuesday at Tampa Bay, carrying a 1.44 ERA over his last eight starts into the outing. LHP James Paxton (8-4, 3.70) is expected to return from the disabled list Monday when the Mariners open a three-game series at home against the Houston Astros. He was out of action because of a stiff lower back.